This Noble Chemical Excel aerosol stainless steel cleaner and metal polish utilizes an advanced, water-based formula to provide the best of both worlds. The oil-out emulsion enables the product to clean and polish like an oil based product but without the oiliness or flammability. It is excellent for elevators, escalators, and other areas where residual oil cannot be tolerated. It's also great for use in food preparation areas, where the odor of mineral spirits and aromatic solvents would be objectionable. This lemon scented stainless steel and metal polish cuts through grease and oil while leaving a protective shine. It works well on other metals such as chrome, brass, copper, and more! The mystery of cleaning stainless and getting a mirror finish is over. I've been told several remedies and recipes for getting that mirror finish but haven't been able to pull it off until the simple purchase of the Noble Excel Stainless Steel Cleaner! This metal polisher worked very well on our stainless steel counters and appliances. I did not have to spray on too much for it to start shining. I have used a polisher from another name brand and their solution was way thicker than this. This one is so much easier to rub/wipe on evenly. Finding a good stainless steel cleaner is not always the easier thing to do... rest assured that the quality of this stainless steel cleaner is at the top of our list!!! W shave never had any problems with this brand... we will continue buying over and over again. Inside our culinary class, we use our stainless steel polish for all of our stainless steel surfaces( tables, fridges,freezer). This product makes the surfaces look brand new and the only downside being you can't let it stand on the surface or it’ll leave a noticeable mark as if it was chemically etched. Overall, I recommend this product to clean your stainless steel. Good stuff, polishes all the stainless steel surfaces perfectly in our home. It doesn’t leave any greasy or waxy residue on anything, I also use for all my small appliances, works very well. This Excel stainless steel cleaner/ metal polish does an amazing job not only cleaning stainless steel, but also giving it a streak free shine. It also leaves a nice clean scent. This stainless cleaner is great and has a really nice fresh lemon scent. I would definitely recommend it and will buy it again when we run out! I use it for all of our stainless steel in our kitchens--fridges, work surfaces etc. This stainless steel cleaner works amazing. It leaves my appliances looking like new. I would highly recommend this product to anyone needing stainless steel cleaner. We ordered some new equipment and it came heavily marked from the manufacturer. They recommended this product, and it did a great job cleaning the stainless. We have since used on all our other stainless steel surfaces and it is not only incredibly easy to use, but does a great job shining them up. This is a good quality stainless steel cleaner we actually use it to publish our copper bar top. It leaves a nice sheen and not any greasy residue. Never had a problem with shipping. Compare is very favorably to the easy offbrand alternative. This stainless steel cleaner works great and saves my restaurant a lot versus buying from other avenues. It cuts through grease very well and does not require a ton of scrubbing. Five star, five star, five star! This product is the ONLY acceptable stainless steel cleaner out there! You will need to sanitize your surface first and remove stuck on debris, but that's something you should do anyway. Once that's done, this will shine up your stainless steel to almost reflective quality. It's awesome. We have tried bar keepers, wilson, microfibers, polish, etc. This is the one. I use this stainless steel cleaner on all of my stainless appliances. Works very well as a cleaner and polisher. Would reorder again if needed for the future. My took told me to get some Sheila shine and I about had a heart attack when I saw the price. So I bought this for him instead and it works just as good! This stainless steel cleaner is great for cleaning the sinks and work tables in our bakery at the end of the day. They keep the stainless (literally) spotless. SO MUCH better than the brands you can buy at local grocery stores! Cleans and truly makes the steel shine. Does require a bit extra of product to get desired effect. I've used the Noble Chemical Excel Stainless Steel Cleaner / Metal Polish - Aerosol 18 oz. (AMR A142) is a great stainless steel cleaner / polish I've been using to keep all my stainless steel looking good as new. I highly recommend this product. This is the best stainless steel cleaner and polish I have ever tried. It’s water based, so it’s not all greasy or oily and has a pleasant lemon smell. This is my favorite stainless steel cleaner. The spray goes on evenly and thick. It is easy to wipe up and it dries streak free. The price is great and the can lasts a long time. Really effective at cleaning stainless steel. Cleans off dirt while at the same time leaving the surface with a nice shine, making it look like new. This product is really great. We have a fairly large kitchen that is completely stainless, and we love this cleaner. It doesn't take much to get the surfaces clean and shiny, so it lasts a long time, and is very well-priced so we save a good chunk of money with this cleaner. Much much much cheaper than the stainless steel cleaner we were previously using and does the exact same job! Cutting costs are what it is all about right?! What a great cleaner, way cheaper than buying in a store or retailer. This works awesome and makes the stainless look shinny and clean. I will it again. Great cleaner so glad we bought the case now we will have it for along time and have sparkly stainless steel even with the tough spots. Works as described. Like the product but have not tried any of the other more expensive brands. Does a good job but have to apply twice sometimes to get the finish im looking for. No complaints but may try different brand next time. Noble chemical excel stainless steel cleaner/metal polish aerosol 18 oz. can. Great for your stainless steel appliances in your kitchen even stainless steel tables! I used the Noble Chemical Excel Stainless Steel Cleaner on my Gold Trim Chafer. It gave the Chafer a wonderful shine, much better than just washing with soap and water. In the coffee business the cost of equipment alone clean and great looking chrome make proper maintenance essential. That's why we use Excel Stainless Clean. I was a bit hesitant to try this Noble Chemical Excel Stainless Steel Cleaner / Metal Polish Alternative - Aerosol 18 oz. (AMR A142) on my stainless steel appliances, but because the price was so good I gave it a shot and I am beyond happy. I am switching to this product from now on. It's a good size can so It will last a bit longer than the other brands I used before and my appliances were very clean and shiny...I am super happy with this product. This is an amazing product. It helps clear away everything from metal surfaces and leaves no streaks. It starts working before you can even start wiping. Wow! this stainless steel spray really works! I sprayed it on my appliances, and was pleasantly surprised to see that the stains came off and the shone stayed on! I love this Noble Chemical Excel Stainless Steel Cleaner/Polish. I usually use 91% rubbing Alcohol to disinfect/clean my Stainless Steel table, but this Polish is Key to making your Stainless Steel shine like new! Not only do I use it for my SS Table, I use it to Polish my Stainless Steel Fridge, Dish Washer, Oven, Microwave, ETC. Great Smell, and doesn't leave a foggy haze like other brands! Sir Clean use Noble Chemical Excel Stainless Steel Cleaner / Metal Polish - Aerosol 18 oz. (AMR A142) because keep your stainless steel surfaces shiny and clean, good results. Excellent Stainless Steel Cleaner/Polish, I use it to polish up my stainless steel push cart. Cleans and makes it shine well, Also use on my stainless steel umbrella pole. It is a common spray. It was easy to use . Do not use much product to clean the stainless steel refrigerator . The smell is pleasant. Great cleaner..... Would always recommend for any stainless appliance you have. I used this for my chaffing dishes......Great, and good quality. Will definitely order more. This takes care of business just as good if not better than any stainless polish your purveyor or local supply house can give you. nice Noble stainless steel cleaner. Perfect on all our stainless tables. Cleans and leaves a streak less finish. I'm surprised how long a bottle last. I thought we would have to really spray a lot to get the results we wanted , that's not the case. Little spray and little rubbing. Great bang for the buck. This is a competitively priced steel cleaner and it comes to you. We can use a lot less of the noble then some other brands, so it makes it a steel of a deal (ha ha). I've ran out and had to run to the store in a pinch and it's just not the same. It doesn't streak and doesn't have an overly harsh odor like some cleaners can have. We love this stuff. Overall, Noble is a good product, but we did not care much for this SS cleaner. It seemed to take extra product to cut through the residue and left a hazy look after use. Overall, it is good for simple messes but not so much for heavy duty commercial in our opinion. Check out the 3M 10oz. Aerosol SS Polish also! This cleaner/polish works great. I am glad we found this product, before we were using Vinegar and water to cut the dirt and prevent streaking. We use this after each even to make sure our stainless looks like new. I bought this cleaner for the stainless steel smoker that I use for my BBQ catering business. It does an excellent job cleaning grease and fingerprints. I use this in my donut shop on all my stainless steal surfaces and I was not disappointed. Great value and this is a highly recommended product. This along with a little elbow grease can bring you a brand new kitchen. Make sure you use gloves and protect your clothing but otherwise it works well. Very similar to sheila shine but much better price and size of container. Used it and it works as well if not better than the compatible product. The 18 oz Noble Chemical Stainless Steel Cleaner and Polisher from is an effective product that gives a good polish. We don't love the aerosol spray as opposed to a normal spray bottle, but other than that, it is great. This product works very well on my stainless steel appliances. It doesn't have a strong odor and what you smell is not unpleasant, it is much less expensive than some other store-bought brands for the same functionality. I would highly recommend this product. This cleaner is just as good as popular brand name polishes. It really works well for adding a clean and protective shine to all things stainless steel. I have used this product on my Frig, dishwasher and garbage cans and found it easy to use. Will not require much buffing. Would suggest using light coats when applying....that's all you need to use. Product goes a long way. This cleaner/ polisher smells really good and works well polishing. i use it for cleaning prep tables and refrigerators and they look great after use. This is a wonderful metal polish! We use these to scrub down all of our chaffing dishes and it shines them up like new! It gets rid of those annoying wipe rings! The 18 oz. Noble chemical 'Excel' stainless Steel Cleaner / Polisher. It is great for cleaning those stainless steel appliences, as well as prep tables. Everything keeps that perfect stainless steel shine with this product. The 18 oz. 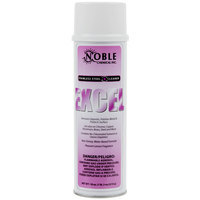 Noble Chemical "Excel" Stainless Steel Cleaner / Polisher - works great on my equipment in the kitchen. Makes everything look new again. This is great for keeping a nice shine on all of the stainless steel items in your kitchen! Just apply to a clean surface and polish off! Protects surface longer than if left untreated!! Great stuff. Polisher, shines my equipment right up, without a lot of scrubbing and elbow grease. Quality product and the price with shipping was still a good buy. Works as well as any other stainless cleaner I've used. It takes a little elbow grease to remove all of the marks, however the finished product looks great. Does an excellent job of cleaning, but it can't really be used when the shop is open or around food. Very strong odor. We feel we can only use it out of hours in a controlled environment.